To support the needs of Singapore’s ageing population and changes in social support structures, St. Andrew’s Mission Hospital (SAMH) and its sister organization, Singapore Anglican Community Services (SACS), have been building up senior care services and nursing homes to enable the elderly to age in place in their community, close to their loved ones. In 2016, the Ministry of Health (MOH) appointed St. Andrew’s Mission Hospital through a competitive Request-for-Proposal tender to operate the Build-Own-Lease (BOL) nursing home at Queenstown. 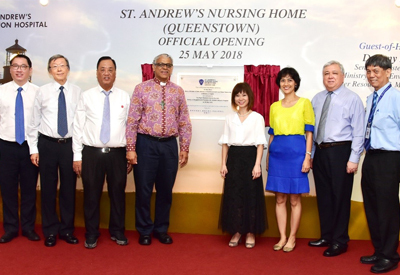 St. Andrew’s Nursing Home (Queenstown), also known as SANH (Queenstown) began operations in April 2017. 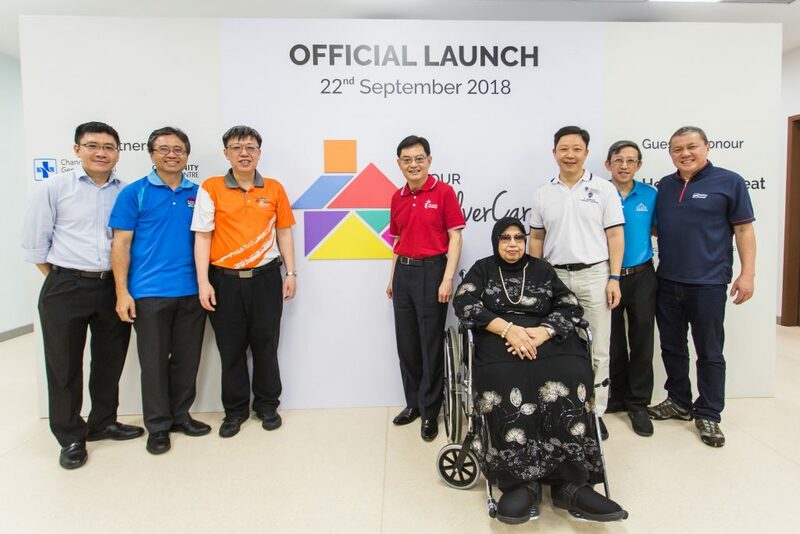 The Home also has a co-located senior care centre, St. Andrew’s Senior Care (Queenstown), also known as SASC (Queenstown), which commenced day care, dementia day care, community rehabilitation and centre-based nursing services in November 2017, and home care services in April 2018. SANH (Queenstown) has a capacity of 297 nursing home beds with 52 beds in the dementia care ward. SASC (Queenstown) is able to accommodate up to 100 seniors daily for day care, including dementia day care services. “Our intention is for SANH (Queenstown) to be a warm and welcoming community facility. We invite all in the Queenstown and neighbouring constituencies to engage with the seniors in our homes. Since April 2018, SANH (Queenstown) has opened its gymnasium for the general public’s use during weekday evenings. We have also been working with schools in the vicinity by having their students come to have joint activities with seniors in the nursing home and senior care centre,” said Mr. Chan Wah Tiong, Chief Executive Officer, St. Andrew’s Nursing Home Cluster and Executive Director, St. Andrew’s Nursing Home (Queenstown). SANH (Queenstown) is one of the latest institutions joining the suite of services operated by SAMH, which includes community hospital, nursing homes, senior care centres, autism centre, and primary care clinics. Dr. Arthur Chern, Group Chief Executive Officer of SAMH and SACS said, “SAMH and SACS, the two community service arms of the Anglican Church Ministry, both with their respective expertise in seniors care and psychiatric rehabilitation, have developed synergies in meeting the needs of the ageing population. 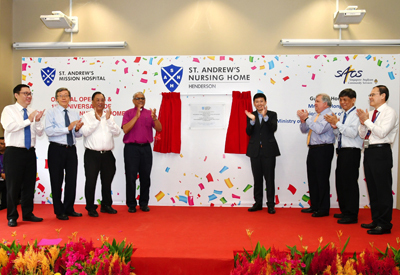 We tapped on these expertise and partnership when we set up St. Andrew’s Nursing Home at Buangkok in 2013 to provide long-term residential care for patients with stable mental health conditions and persons with dementia. This service has seen positive outcomes in its residents. SAMH and SACS have further leveraged on each other’s strengths with the setting up of senior centres at Kampong Glam, Henderson, Hillview, Tampines, Yishun and Jurong West. Today’s official opening of SANH (Queenstown) was officiated by Dr. Amy Khor, Senior Minister of State, Ministry of Health. Dr. Khor was joined by over 100 guests from the Ministry of Health, Agency for Integrated Care, grassroots leaders and representatives of the Tanjong Pagar GRC, Henderson-Dawson Constituency, the Lew Foundation (a supporter of the work of St. Andrew’s Nursing Home), volunteers and supporters. Dr. Khor toured the nursing home, and interacted with residents, and their family members.